CaptureSpace is the tool that is used to create media for Kaltura. 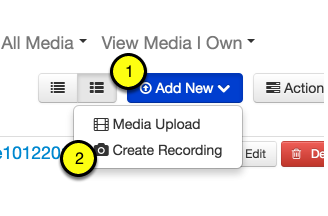 You can launch CaptureSpace from "Kaltura My Media" by 1) clicking on "Add New" and then 2) selecting "Create Recording". Note: The first time you access this feature, you will be asked to install the CaptureSpace plug-in. For faculty/staff using computers on campus, this plug-in can be installed without administrative rights. 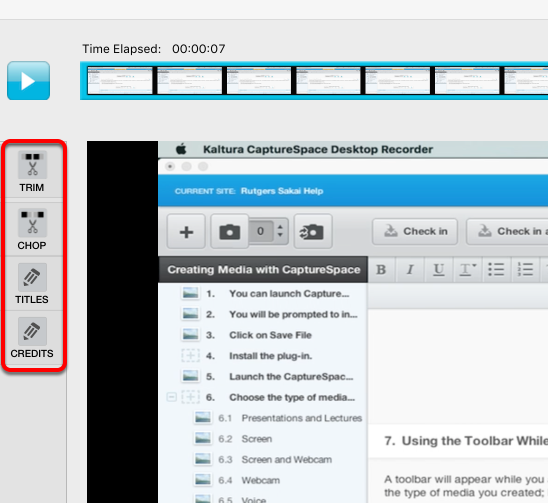 You will be prompted to install the Kaltura CaptureSpace Desktop Recorder plug-in. Choose your machine type and click on Download. Save the file to your computer. Find the saved file and click on it to begin installation. 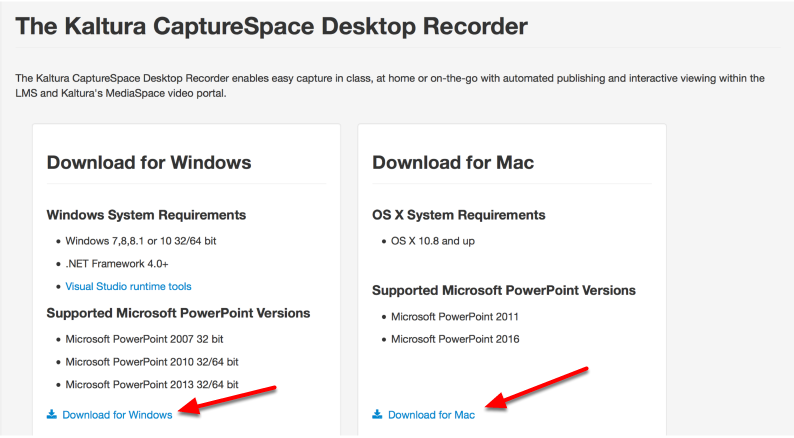 Once installed, the CaptureSpace Desktop Recorder will open. Note: You only need to do this once, you will not have to install the plug-in again to create media on the computer you are using. 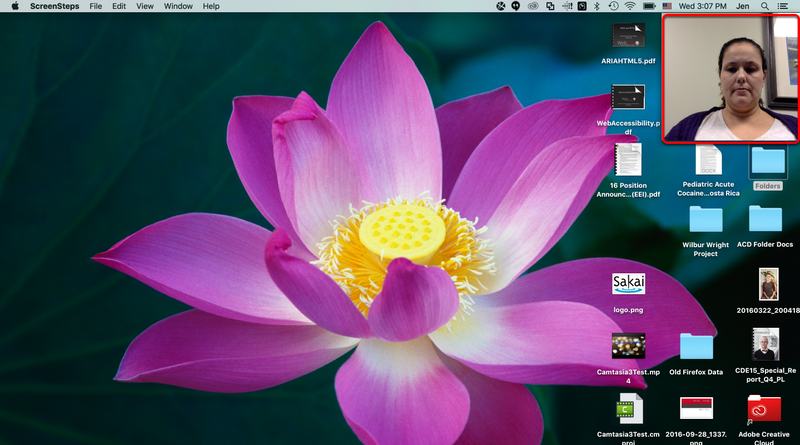 Kaltura allows you to choose from several media types. When you choose this option you will see a few items that can be adjusted that will change the output. Camera: you can choose to record at a lower resolution to create a smaller file size. If you will be streaming from Kaltura the file size isn't an issue. 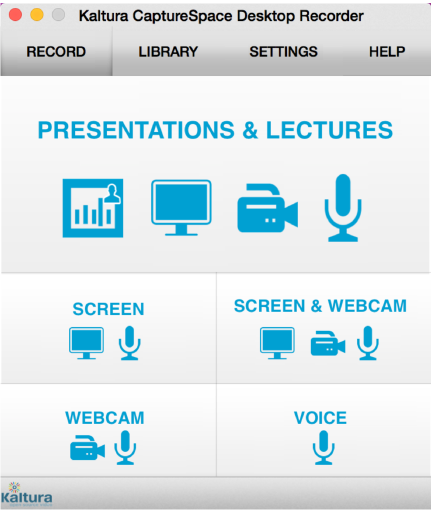 Screen Capture: if you have multiple screens you can choose which you want to record here. You can also change the recording resolution here as well. 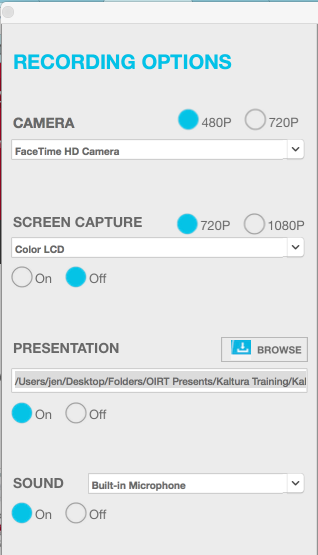 Presentation: By switching this to on, you are able to browse your machine to look for the presentation you want to record. Enable keyboard actions for presentation recording on Mac OS X 10.8, under System Preferences -> Universal Access -> Keyboard check “Enable access for assistive devices”. On Mac OS X 10.10, under System Preferences -> Security and Privacy -> Privacy Tab, check the box to allow access to Kaltura CaptureSpace Desktop Recorder. Use the arrows at the bottom left of the presentation to advance your slides as you're recording if you don't want to change your keyboard settings. 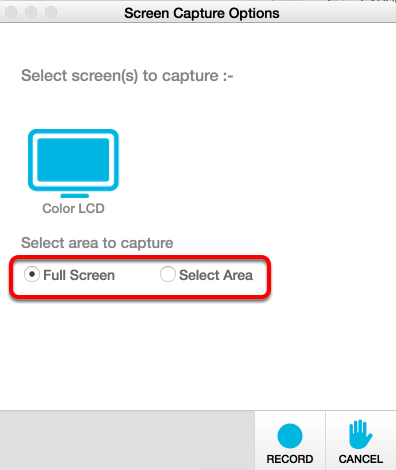 Select whether you want to record your Full Screen or a Select Area. 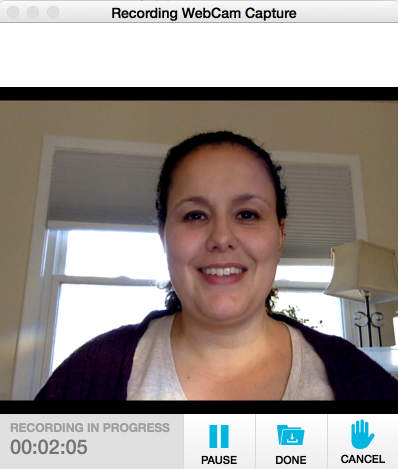 It will record your full screen (or a specific area that you choose) and webcam. Kaltura does not offer powerful editing capability. Chop allows you to alter media from in between the beginning and end points. Titles allows you to add a slide with text at the beginning of the media.